Praise for Aquifer Hydraulics . . .
"A valuable source of information for every student and practitioner of quantitative hydrogeology. I commend Dr. Batu for the thorough research and dedicated effort that went into the preparation of this book." -Stavros S. Papadopulos, Chairman, S. S. Papadopulos & Associates, Inc. 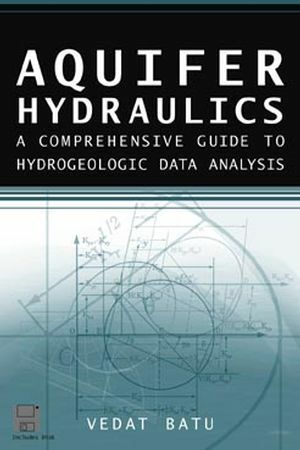 This book offers the most detailed and comprehensive coverage available of aquifer hydraulics, testing, and analysis for a wide range of aquifer and well types under differing conditions. It presents the theoretical foundations and limitations of existing analytical models for each ground water system, along with an in-depth examination of hydrogeologic data analysis methods. Translating theory into practice, detailed examples illustrate the real-world application of well test techniques-an invaluable aid to readers in the design, execution, and analysis of their own field tests. With an accompanying computer disk packed with data analysis programs, Aquifer Hydraulics is an essential tool for practicing and aspiring hydrogeologists, environmental engineers, and others involved in aquifer evaluation and protection. VEDAT BATU, PhD, PE, has worked as a consulting engineer on aquifer and ground water-related projects for over a decade. A former university professor who has taught extensively in the United States and Turkey, Dr. Batu has written articles for numerous scientific and technical journals, including Ground Water, Journal of Hydraulic Engineering, Journal of Hydrology, and Water Resources Research. INTRODUCTION AND FUNDAMENTALS OF AQUIFER HYDRAULICS. HYDRAULICS OF AQUIFER UNDER STEADY PUMPING CONDITIONS FROM WELLS AND HYDROGEOLOGIC DATA ANALYSIS METHODS. Fully Penetrating Pumping Wells in Homogeneous and Isotropic Confined and Unconfined Aquifers. HYDRAULICS OF AQUIFERS UNDER TRANSIENT PUMPING CONDITIONS FROM WELLS AND HYDROGEOLOGIC DATA ANALYSIS METHODS. Fully Penetrating Pumping Wells in Homogeneous and Isotropic Nonleaky Confined Aquifers. Fully Penetrating Pumping Wells in Homogeneous and Anisotropic Confined Nonleaky Aquifers. Fully Penetrating Pumping in Homogeneous and Isotropic Confined Leaky Aquifers without the Storage of the Confining Layer. Fully Penetrating Pumping Wells in Homogeneous and Isotropic Confined Leaky Aquifers with the Storage of the Confining Layers. Partially Penetrating Pumping and Observation Wells in Homogeneous and Anistropic Confined Aquifers. Fully and Partially Penetrating Pumping and Observation Wells in Homogeneous and Anisotropic Unconfined Aquifers. Fully Penetrating Pumping Wells in Homogeneous and Isotropic Bounded Nonleaky Confined Aquifers. WELL EFFICIENCY AND HYDROGEOLOGIC DATA ANALYSIS METHODS. HYDRAULICS OF SLUG TEST AND HYDROGEOLOGIC DATA ANALYSIS METHODS. Fully and Partially Penetrating Wells in Aquifers. HYDRAULICS OF PRESSURE PULSE AND CONSTANT HEAD INJECTION TESTS FOR TIGHT FORMATIONS AND HYDROGEOLOGIC DATA ANALYSIS METHODS. Fully Penetrating Wells in Confined Aquifers.